Main Attractions: Scenic pond, shoreline trail, forest hike, nice overview. Seth Low Pierrepont State Park is just a few minutes from the center of Ridgefield, CT and is a wonderful place to escape for a few hours. Though there may not be spectacular views, sprawling open fields, or rugged up hill climbs, it's a neat little place with varying terrain. A good size pond greets visitors and it's teaming with life - your footsteps along the shoreline trail will surely cause many a frog, fish, or turtle to leap, splash, scurry, jump. The forest trees are tall and birds of all types are right at home. 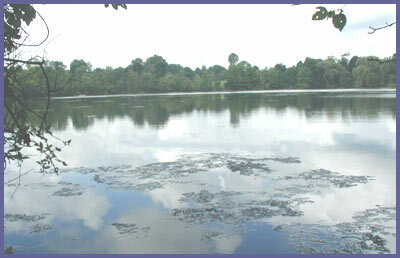 Many locals use Seth Low to kayak, canoe, fish, swim, and escape into forest. Neighborhood homes are dotted along the water's edge or close by so the initial shoreline hike requires you to navigate past frequented fishing holes, possibly a recent teenage campfire spot, and a backyard but you'll soon disappear away from the hustle and bustle as the trail takes you to the far end of the pond. It's here the forest takes and the trail systems winds and loop way back into the woods. There's even a nice little overview which makes for a good spot to rest and recharge before exploring further in or heading back to the car - though it's important to point out that the overview isn't grand or spectacular (it probably once was a magnificent view overlooking the pond but the trees have matured and grown so much over the years that the pond view is completely obscured). The trail begins at the parking lot and you just follow the white hash marks into the woods and over to the pond's shore. Seth Low is a popular place for those launching paddle boats, fishing, and in some spots has that feel of a hangout (broken bottles, illegal campfires, some littering). Therefore, the first 5-10 minutes of the hike is nice because of the pond scene but you'll likely want to get right past this stuff and onto the more remote sections of the trail. There's even a house practically on the trail and you almost feel like your intruding but don't worry because you have every right to be there and the trail will quickly take you away from the house. Once beyond this stuff (which really isn't a big deal at all) the trail really comes to life. The far end of the pond is very picturesque. Frogs, fish, and turtles leap, splash, and scurry as you approach them. Swans, ducks, and herons are easily spotted and obviously used to people so it's not hard to get a nice glimpse of them. It's likely that folks will be out on the pond fishing which adds a nice touch to the scene. The day I hiked, two separate father/daughter groups were out on small boats fishing and having a great time. Eventually the white trail makes it's way into the forest. It's a little swampy at first and remember to carefully walk over the wooden planks and bridges as some of the boards seem a little worn. It's always fun to listen to the hustle and bustle fade off as you make your way into the woods. If you're visiting during the hot days of summer bring bug spray with DEET. I was there during a hot August day and didn't have too much of a problem but I wasn't there early morning or evening when mosquitos are most active. And back in the main area I noticed a sign that said West Nile Virus has been found in parts of western Connecticut and mosquitos can spread the virus. But this is just a cautionary warning - it does not mean West Nile is there at Seth Low...the DEP by law has to post those kinds of warning. Visit the DEP West Nile page for more information on how to avoid it. But the tall hardwoods and lush cover soon take over and leave the swampy area behind, providing a nice canopy for peace and quiet. The water sounds fade out and the chirping of birds and chipmunks come into play. A short distance into the woodland portion, the white trail meets the blue trail. 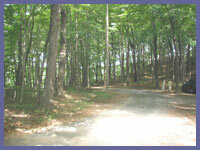 The white trail goes to the left and continues along a woodland hike. The blue trail goes to the right, over a footbridge, and up to the overview. It's not a difficult hike but there is a very short section of trail that is slightly steep. Also along the way watch for the big blue arrow painted on a tree telling you the proper way to go...it's a left turn and the right turn the orange trail that wanders into a different part of the park (and don't forget that on the way back, it's a right turn at the orange/blue intersection...stay with the blue trail to make it back to the white trail). The view from atop the blue trail is not spectacular but it's also not hard to get to and a nice little spot so I think it's worth the effort to check it out. You simply follow the blue trail as it winds up a rocky part of the park and eventually to a rock outlook. Just watch your step up along the steep part of the trail and overview area as there as there are some broken bottles and also a few spots with some steep drop offs - this is especially true if children are hiking with you. The overview is a good place to relax and have a drink or snack. You can return the same way you came or explore way back into the woods as the trail system is quite extensive back there but with not major highlights to point out - just the peace and quiet of a nature walk - which ain't too bad at all! There are other options as far as hiking here and to the overview. Visit Seth Low's official state park page and click on the map link and print it out. Bring it with you and create your own path and options. It will help you prevent from becoming lost or confused by the different colored trails. Directions: From the north (Danbury area) take Route 7 then Route 35 to Ridgefield Center. At Ridgefield take a right onto Route 116 off of Route 35 (past all the shopping centers but before historic downtown). From the south (Fairfield or New Haven) take Route 7 north to Route 102 and follow Route 102 to Ridgefield center. Take a right onto Route 35 and go through historic Ridgefield with all the small shops, etc. Bear left onto Route 116. From Route 116 it's 2.2 miles exactly to Barlow Mountain Road. Take a right onto Barlow (small brown sign with boat launching symbol is visible). A short distance down this road is a stop sign. Look over to the left and you will see the sign and entrance for Seth Low Pierrepont. Drive over and park in the dirt lot making sure not to block anyone from entering, parking, or leaving. White trail markers are clearly visible on the trees. Head on in. http://dep.state.ct.us/stateparks/reserves/sethlow.htm is the official website and they have their own driving directions.